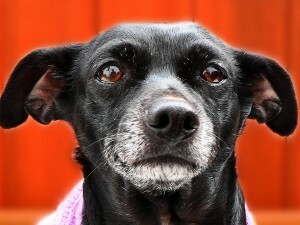 Senior dog care is a growing concern among owners. Due to improvements in veterinary care and dietary options, along with healthier habits, dogs are enjoying longer lifespans. So when does your dog become a senior pet? Around age 7. Larger breeds that normally have a shorter lifespan will start being considered a senior pet around age 6, even if they still act like a puppy. When your dog enters their senior years they have a shift in dietary, veterinary and exercise needs. Dietary needs include changing them to a diet that is more readily digestible, with a different caloric level and ingredients. A diet specifically formulated for senior pets is optimal at this stage where their kidneys may be working harder. Increasing your veterinary care from an annual to a semi-annual visit can help detect and treat signs of problems or illness early. Senior pet exams are usually the same as regular exams, but may include more in-depth blood work, dental care and specific monitoring for diseases that are more likely in older pets. Dental care should not be overlooked, oral health can be directly linked to kidney and liver issues. Senior pets are more likely to have diseases that do not normally affect younger ones, such as heart, kidney/urinary tract, liver diseases, cancers, diabetes, joint or bone problems, and weakness. Maintaining a healthy diet, exercise and weight. Do you have an older dog? What special care do you show it? The post Senior Dog Care appeared first on Pet Assure Blog.